One by one they took the podium to pay tribute to a man so beloved, that even the most gifted speakers among them ran out of superlatives. 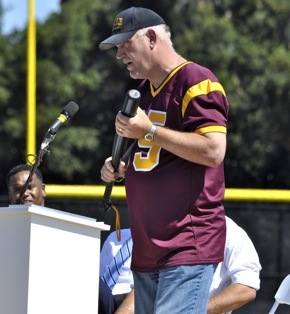 Menlo-Atherton High School’s legendary Coach Ben Parks was eulogized today as teacher, mentor, disciplinarian, wounded defender, friend, family man, confident and counselor. The two-hour memorial tribute, attended by the Coach’s adult children and grandchildren (above greeting participants), took place appropriately on the football field that bears his name. Players from throughout his 32 years at M-A came to pay respects, many reuniting for the first time in decades. 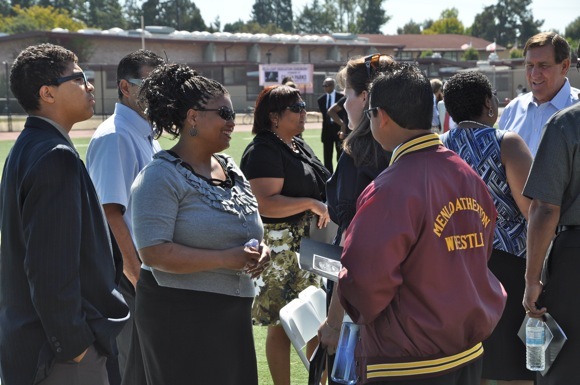 While almost every speaker’s words brought tears, there was also laughter and joy. 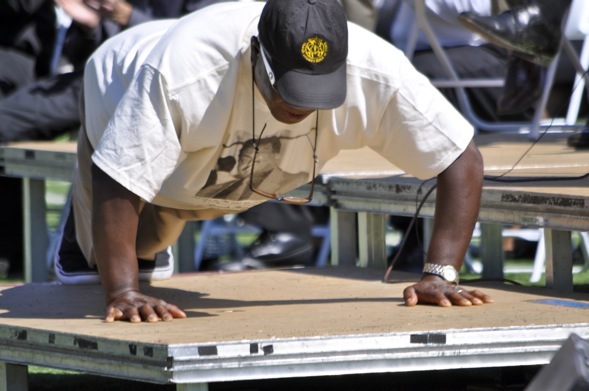 Lawrence Brice, representing Edison High where Coach Parks spent three years before coming to M-A, got down on the platform to do a series of push ups, to the delight of the many representatives in the audience who played for Coach Parks. NFL Pro Football Hall of Famer Ronnie Lott (top photo, right) who trained with Coach Park as member of fitness group, the Wild Bunch, reminded the audience of the Coach’s love for his wife and family, “Man, if we could love like that man loved, we could exhaust that muscle,” he said.